Last week AWS Foundation announced a $2 million gift to Arts United’s A Soaring Vision campaign, which aims to create a more inclusive experience for patrons with disabilities on the United Arts Campus, as well as easier accessibility. AWS Foundation CEO Patti Hays explained with help of an audio presentation, that performances at the Arts United Center, are one-of-a-kind in the community because of the type of shows they present. But for some patrons, experiences could be enhanced. Hays’s presentation gave listeners the feeling of sensory overload. “If this was overwhelming for you in this brief example, imagine what it’s like for an individual who lives with this everyday,” Hays said. The AWS Foundation strives to help community groups be inclusive. To help enhance the experience for all patrons of Arts United, officials have launched a five-year plan to ensure compliance with the American with Disabilities Act, including wheelchair accessible ramps, and more recently, sensory aides, such as books or videos. “Because of all these efforts, the families in our regions, families who never had the opportunity to experience a live performance, now have that chance,” Hays said. While theater sensory events aren’t new in the Fort Wayne area, the incorporation of sensory aids in theaters is a growing trend. Susan Mendenhall, President of Arts United, said the group is excited about working on the project with the AWS Foundation. Mendenhall said it’s important that community landmarks, like the Arts United Campus are accessible to all community members. “We believe that it’s essential that this important cultural district is important and that individuals of all abilities can participate here, in the arts, both as audience members, as performers, as employees, as board members. We want to make sure that they feel welcome,” she said. Arts United Chairman Doug Wood said the five year project, set to begin construction in 2023, will be transformative for the Arts United campus. He said the Arts United Center will receive upgrades that are now standard in theaters across the country. The theater was completed in 1973, before the American with Disabilities Act was passed, leaving out a lot of key aspects of the legislation, like accomodations for performers. The Soaring Vision campaign aims to fix those issues across the campus. But as Mendenhall pointed out, restoring the Center is somewhat tricky. 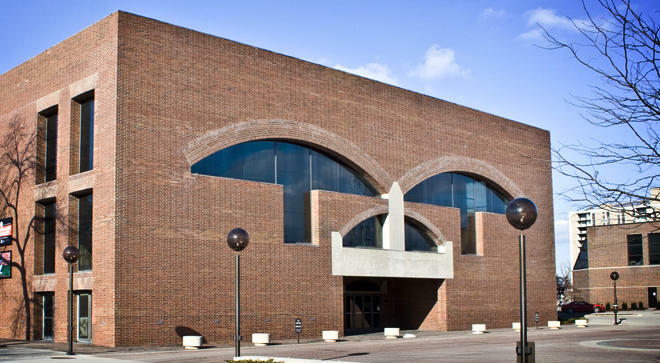 Not only do they have to think about making the improvements the center needs, but they're also trying to keep original aspects of the building as intact as possible because it was designed by Louis Kahn, a prominent American architect. “A 47-year old building has a lot of needs, and in some regards, we’ve done a really excellent job preserving this building as it was designed and we want to stick to that as much as we can,” Mendenhall said. Wood said the timing for the project couldn’t be better. He said the Arts United Campus stands to benefit from all of the improvements happening downtown. “The quality of space, the quality of life attributes that we talk about, when we’re trying to get talent from outside the region, to come into our job market is something this town has and something we want to make one of the key reasons why people would relocate to Fort Wayne,” Wood said. The Arts United Campus consists of seven seven buildings located within three walking blocks. The Arts United Center in Fort Wayne.